In the art gallery of the Kirstenbosch Botanical Gardens near Cape Town we bought a sculpture of Boniface Chikwenhere. From who? From Boniface Chikwenhere. Not many people have heard of him, till now. The piece of art is an owl of about 70 cm high, made from driftwood. It combines past nature with the nowadays art scene. It will be difficult to find a region where pure nature, history of mankind, and expressions of art, are so interlinked as in the southern part of Africa. Art that makes references to that mixture has a longstanding tradition in Southern Africa. Starting from one of the eldest art expressions in the world, the Rock Art engravings and paintings of the San Bushmen of Southern Africa (dated from 100.000 years ago! ), the in the western world well known but of a later period ritual ethnographic art of this region, to our global contemporary art. The young and promising Boniface Chikwenhere is an example of the last category. In his art, he specially focuses on the handicraft side of art creation. That kind of creation, though generally spoken not favored in the modern art world, is not an indecent base at all. On the contrary, it was and still is one of the fundamentals of art. A lot of contemporary artists have a total lack of it, often at their disadvantage. As an unsubsidized artist within the harsh African economic and cultural climate, Boniface has to make a living of his art, and he can. But unfortunately, he hasn’t had the opportunity till now to go the totally free artistic way that most modern artists wish to follow. I saw Boniface working in his atelier, experienced his artistic objects, and I could not but conclude that the art world and art lovers may have well motivated expectations about his artistic potencies and career. Boniface Chikwenhere was born in a small town called Kwekwe in Zimbabwe on 29 March 1981. He did not attend a regular art school. He learned the profession from his family who were skilled craftsmen in various mediums including woodcarving and stone working. At the age of 27, he left Zimbabwe and went to South Africa. Some years later he started his workshop ‘Unique Driftwood Creations’. He is a member of the SASA, the South African Society of Artists, and the Western Cape Artists Group. Boniface works with selected galleries in Cape Town and nationwide, and makes commissioned work as well. He participates in exhibitions all over the country. All the art objects he makes are unique pieces made from driftwood, found wood and fossilized or petrified wood. He lives and has his workshop in a new urban village close to Strand / Somerset West in the Western Cape Province. We visit Boniface in his small workshop, for which he uses the garage and the small garden behind his home. The houses in this simple but clean neighborhood are small, look all the same, stand in sharp square rows and have a friendly light grey color. It is very hot on the day of our visit. A warm, stormy wind hits the region. There are water shortages, the reservoirs have only twenty percent of their capacity. Almost four months already without one drip of rain. Nature can be harsh here. Nobody on the streets, only some lean dogs. The taxi driver tells us to be careful and not to react when someone you do not know appears and tries to attract your attention. Robberies and drug related crimes are not far away in this kind of areas, we hear from people we speak. The taxi driver tells us, he better waits for us till we finish our visit. On the Helderberg Mountain some kilometers away we see the smoke of a bush fire. Fortunately, the heavy black grey is going in the opposite direction. The house on the corner at the end of the street is totally gated. Barbed wire has been placed on the man-sized fences. We ring the bell. A young assistant of Boniface opens the door and lets us in. 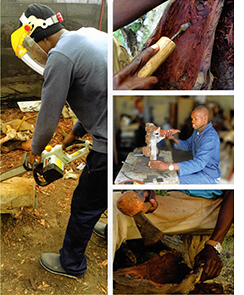 Boniface warmly shows us his atelier and way of working. He uses two places of the small house. The tiny closed and paved back garden is crowded with hundreds of pieces of raw driftwood on selected bunches. In the unshaded midst is some free space, something to sit on and to work. That is the place where Boniface does the first raw carving work. In the small neighboring garage the next phases in the creating process are done. In some parts of the process he is helped by an assistant. The garage is crowded with many wooden objects in different stages of finishing to become a piece of art. We did. We saw and experienced the transformation of the creation: from nature to Nature, and from nature to Art.